WordPress is an extremely popular publishing platform which is used to power millions of blogs and websites around the world. It can be used to create blogs and websites that are rich in features and enables you to publish posts and pages, customise your site with various widgets, themes and bespoke menus and use plug-ins to make your site even more functional and impressive. Read on if you have been looking for ways to speed up WordPress. One of the main drawbacks of the platform is that it can sometimes grind to a halt for various reasons. 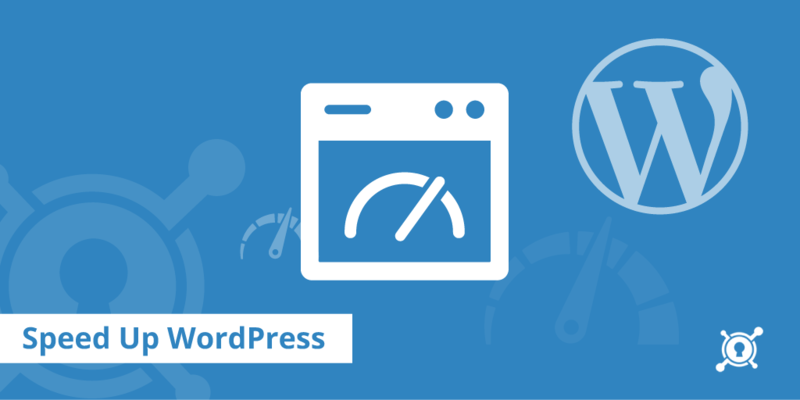 However, there are many steps you can take to speed up the performance of WordPress to save time and make using it more enjoyable. At UK Web Host Review, we’ve taken the time to outline some of the most effective techniques for boosting the performance of your WordPress site. WordPress has helped many companies and organisations to save significant amounts of time and money. This is because WordPress is so simple to use that it it’s possible to run your own site yourself without relying on help from outside. Many companies not in a position to pay someone else to design, build and maintain websites have used WordPress to oversee website management themselves. Some companies have paid outside sources substantial figures to create websites on their behalf, only to find they have to hand over more money every time they wish to make the smallest change. Thankfully, WordPress is so simple to use that updating your site can become a breeze. WordPress has proved itself to be ideal for those who don’t wish to opt for an unprofessional-looking free site but cannot pour vast sums of money into expensive, high-end sites. WordPress can provide you with a simple yet effective and professional site that can rank well on the search engines, drive visits and boost sales if applicable. WordPress itself is free, whilst there are many inexpensive yet impressive web hosting solutions available to you. The vast range of themes and plugs-ins on offer means you don’t need to settle for an undistinctive, generic website when you go down the WordPress route. You can even build a highly-functional website without extensive programming knowledge. If you don’t have the time to set up your website yourself using WordPress, you shouldn’t find it too difficult to get someone else to do it for you for a modest fee. There are more than 10,000 plugs in available that will let you add vast types of functionality to your site including SEO, social media sharing, slideshows and much more. Thousands of themes are on offer, and you can change the appearance and layout of your site easily without having vast experience and skill. You can update your website whenever you like, and what’s also great about WordPress sites is that they are looked upon very favourably by Google and the other leading search engines. Google has actually taken the step of recommending WordPress for business sites. The ability to update your site with ease, means you can post the frequent content that wins over search engines and customers alike, boosting brand engagement and exposure levels remarkably. Studies suggest that almost one in ten sites are now powered by WordPress. What’s more is that the platform has a vibrant and thriving community, which means help is never far away if you do need assistance with something, including ways to speed up WordPress. So, why is speeding up your WordPress so beneficial? There are many benefits attached to speeding up the performance of your site. Speeding up your site will bring you faster-loading pages, which in turn will enhance the user experience, reduce visitor frustration, increase return visits and support SEO efforts. Studies have shown a drastic drop in human attention span over recent years. In fact, it’s said that during the 16 years leading up to 2016, the average attention span was cut from 12 to 7 seconds. This means it’s essential that site visitors are instantly met with an efficient and smooth service. You need to convince site users to stick around as soon as they land on your page. If your site loads slowly, visitors may well head elsewhere before it has loaded fully. One case study showed that just a 1-second delay could reduce conversions by 7%, customer satisfaction by 16% and page views by 11%. Slow-loading websites have been penalised by Google for some time, which means you could be risking being pushed way down the rankings and losing vast numbers of visitors if you fail to speed up your site. The speed test report may suggest many methods for improvement. Although some of the language may seem complex and off-putting, gaining a grasp of these terms can be extremely valuable. The main reasons for slow loading times for WordPress sites include badly-configured web hosting servers, poorly-configured WordPress with unserved cache pages, unoptimised images, badly-coded plug-ins and external scripts like ads. The more you know about the technicalities behind slow loading times, the better. Don’t think that just because your site loads up quickly for you that others are getting the same results. If you regularly visit your own site, it may have been stored in your browser’s cache, leading to it opening swiftly. However, those visiting your site for the first time may still be met with slow loading times. Users in different parts of the world may also get different results. There are many tools online that will let you test your loading speeds from different locations. Although 2 seconds may be regarded as an acceptable load time, some users aren’t even this patient. Even removing half or a full second from load time can result in a much better experience for site visitors. It’s essential that we don’t underestimate the importance of a quality web host. Reputable shared web hosting providers will spend sufficient time on optimising performance, though shared hosting does mean sharing resources with a large amount of other people. Busy neighbouring sites can have a significant impact on the whole server and therefore your site. You may well wish to opt for a managed hosting service over a shared one. Opt for a managed service and you’ll be able to benefit from highly-optimised server configurations as well as automatic back-ups, updates and complex but valuable security configurations that will enhance the security of your site. This step is regarded as one of the most effective ways to speed up WordPress. The hosting of your site is widely agreed to be amongst the most important factors when it comes to loading times. Many providers offering “unlimited” bandwidth are unable to provide impressive loading times, especially during peak hours. Furthermore, the vast majority of these providers can’t guarantee more than 99% uptime per month. Nonetheless, the prices of quality hosting packages have fallen significantly with the passage of time. Some companies offering cloud servers require you to do a great deal of the legwork yourself, which can be daunting for those lacking in technical experience. However, there are many hosting providers available who will do most of the work on your behalf and will happily come to your assistance if you do need to be pointed in the right direction. When many people are visiting your site simultaneously, performance can be negatively affected. However, a caching plug in can make your site up to five times faster. The plug in creates a copy of a page the first tie it loads and displays a cached version of it to every visitor after that. You won’t need a caching plugin if you have a managed server as they will look after this for you. Caching drastically simplifies the process the server has to go through when showing pages to users. Some of of the most reputable and useful WordPress plugins are part of the caching category and will greatly improve loading times. What’s also great is that many of them are totally free and wonderfully easy to utilise. W3 Total Cache has regularly been named as one of the most reliable cache plugins on the market and requires you to simply install and activate it to see vastly enhanced loading times immediately. Updating your site regularly is essential. Themes and plug-ins are refreshed regularly, and if you fail to take advantage of them, you could become vulnerable to bugs and security issues as well as slow loading times. Keep on top of the latest updates to avoid performance being affected. Make sure your site, plugins and themes are all updated to the very latest versions. What’s also advantageous about updating your site with new content regularly is that doing so is looked on very favourably by the likes of Google, who also reward fast-loading sites that offer fast performance with better rankings. Visitors are much more likely to hang around when you display images on your page. However, you could be risking vastly reduced load times if your images are not optimised. You can optimise them with photo editing software, which will cut down file sizes and can be used to change the format of your images. In fact, compression can cut the amount of data in your image by up to 20% without significant quality being lost. PNG images are heavy on data, which means its hugely advisable to switch to JPEG if possible. Yahoo!’s discontinued image optimiser Smush.it had a great reputation when it comes to reducing file sizes without noticeably reducing quality. However, the process of reducing one image at a time can be time-consuming, so if you do have a large number of images to upload and are short on time, you may well wish to make use of free plugins like WP-SmushIt which will treat all your images quickly as you upload them and has won a great deal of praise amongst the WordPress community. WordPress will continue to entirety of each article on your homepage and your archives unless you instruct it not to. This leads to homepages, categories, archive pages and tags loading slower. If full articles are shown, visitors may not decide to visit the page in question, which means pageview numbers can be negatively affected. By using excerpts, you can convince users to click through to view full pages and spend more time on your site. The Settings menu enables you to show summaries to your visitors rather than the full text. Although it’s always great to see vast numbers of visitors commenting on your articles and joining the discussion, loading comments can also take time. The Discussion part of the Settings menu offers a Break Comments into Pages option that will help you avoid this problem and enable you to avoid slow loading times likely to send guests away. Most well-known and well-read WordPress blogs are now making use of CDNs in order to cater for visitors across the world effectively. The Max CDN Content Delivery Network has a great online reputation and has been complimented for its intuitive dashboard and generous pricing structure. Furthermore, it comes with video tutorials designed to make the setting-up process smoother and quicker. Uploading your videos directly to WordPress can also vastly reduce loading times. What’s also worrying about this is that hosting videos directly can be very expensive in terms on bandwidth, and you could be faced with a big bill from your hosting provider, who may even decide to close your site. Even if you’re paying for so-called unlimited bandwidth, you may still be met with tough penalties. Hosting videos will also make backup sizes swell and make the restoration process much more difficult. However, help is at hand. You can instead embed videos that you have uploaded to services like YouTube who do have the bandwidth. Just cut and paste the URL into the post and it will be embedded seamlessly, helping you avoid slow load times and penalisation. Though scores of great WordPress themes are available, it’s important to consider speed when selecting one. Some of the most visually-impressive themes have bad coding and can have an adverse effect on load times. Try to strike a happy balance between performance and visual quality when selecting a theme. You may need to experiment with a number of themes before you reach the best compromise. Many WordPress site owners opt for simple theme and select a number of high-performance plugins to get the right visual feel and efficiency. Some of the most reputable theme shops include StudioPress and Array Themes and are great channels for obtaining impressive themes that won’t result in snail-like loading times. Sliders are particularly popular amongst WordPress users but do have a tendency to lengthen loading times. What’s more is that they can even undermine your attempts at speeding up your site, such as choosing optimised images. It’s wise to spend time online researching the best slider plugins for your needs. Nivo Slider, Soliliquy and Meteor all have a great reputation amongst leading WordPress experts and veterans. Do you need to display a large number of photographs? As we have already mentioned, photographs that haven’t been optimised can lead to poor loading times. Many professional photographers using WordPress opt for speedy gallery plugs ins that have been designed for speedy loads. There are many reliable and fast gallery plugins on the market – some of the most reputable and acclaimed include Envira Gallery, NextGEN and Foo Gallery. There are many great reasons for adding detailed, lengthy posts to your WordPress site. Long post can provide your readers with detailed analysis and facts about complex topics and really establish yourself as a leading player in your field. They can also be fantastic for SEO. However, if you do post extensive information supported by a string of images, loading times can be impacted. One way to get around this is to separate your longer posts into pages. Splitting posts into sections isn’t complex – you simply need to use the <!––nextpage––> tag when you wish to end one section and begin another. Long posts don’t need to have an unwanted effect on loading times. Pingbacks and trackbacks tell you whenever your site receives a link, but they can put your server resources under pressure. What’s more there are other resources you can use to assess links of your site, such as Google Webmaster Tools. The pressure on your server comes from the way requests from WordPress are sent back and forth when link ups are made. Additionally, hackers and other cybercriminals can exploit pingbacks and trackbacks in DDoS attacks. You can switch off this functionality in the Discussion area of Settings. Simply deselect “Allow link notifications from other blogs (pingbacks and trackbacks)” to disable pingbacks and trackbacks. WordPress is designed to interact with other blogs equipped with trackbacks and pingbacks. When you are mentioned on another site or blog, data on your own post is updated. Don’t worry about backlinks being lost if you disable trackbacks and pingbacks – you’ll only be losing clutter on your site by taking this step. Though it is helpful to use some files from other sites, overdoing things can also impact load times. A large number of plugins and themes load files from other sites, with many making use of scripts, images and more from the likes of Google and Facebook. However, if your plugins make a large number of requests, chances are that loading times will be effected. You can get around this by disabling some scripts and styles. Many computers owners choose to compress files on their computers in order to save disc space after looking for ways to speed up WordPress. The equivalent of this for WordPress users is GZIP compression, which cuts down bandwidth usage and reduces the time it takes for users to access your site. It means the browser unzips your site before they enter it. There are many plugins available that will enable you to compress your files, though you can also add the code below to your .htaccess file. Again, this step may seem somewhat complex but you can expect your efforts to pay off if you invest time in understanding what you need to do to reduce database calls. You will need to gain some understanding of PHP and the template files of WordPress to perform this step. Unnecessary direct database calls and requests can put too much pressure on your server and can result from badly-coded WordPress themes. Even themes that are otherwise coded impressively may make database calls just to get simple information. The tag <?php marks the beginning of a new database call. If you’re using a child theme to customise your site, the calls can be deleted and replaced with specific information. You can also replace them with static information when using a parent theme. Once you have been using WordPress for some time, you will probably come across a significant amount of unnecessary information. The WP-Sweep plug in can be used to eliminate much of this and will get rid of unused tags, trashed posts and much more, giving your database a much-needed and valuable spring clean. Furthermore, you can optimise the entire structure of your database with just one click. Post revisions can fill up a great deal of your database, and some experts suggest that they might have a negative impact on plugin database queries. Plugins that don’t exclude revisions could search through revisions when they don’t need to. However, it’s relatively easy to limit the amount of revisions kept for every article. You can achieve this by adding the code define( ‘WP_POST_REVISIONS’, 4 ); to your wp-config.php file, which will result in only the last four revisions being kept and older revisions being discarded. If you’d prefer to use a plugin for post revisions, options are available. A plugin called Revision Control enables you to revert to previous versions if mistakes are made and enables you to decide how many revisions you wish to save so your backend isn’t clogged up with scores of old drafts that you no longer require. The higher the quality of your content is, the bigger the chances of someone else using it without your permission become. When other site owners choose to serve your images from their URLs on your site rather than uploading them to your servers, they are using your bandwith, without you even being able to enjoy extra traffic as compensation. Add the code below to your .htaccess file to stop others hotlinking your images. You may also be negatively impacted by content scraping websites, which take content from your RSS feed to create their own posts. Fortunately, there are many tutorials online which will help you prevent content scraping from your WordPress site. Reducing the loading time of your site will vastly improve the experience of your visitors, no matter which device they are viewing your site on. No matter whether they are navigating your WordPress site through their desktop, PC, smartphone or tablet, you can follow the instructions above to create a better experience for site visitors and start enjoying much quicker loading times. Though many of the above steps are relatively simple, it’s certainly worth spending some time getting to grips with the more complex instructions in order to start getting the desired results. Improving loading times won’t just create a better experience for your visitors, it will help you impress the search engines and make your own use of the site more enjoyable whilst enabling you to cut down your bandwidth and avoid other negative scenarios including unforeseen costs and even the closure of your site, whether that be temporary or permanent in nature. Optimising speeds is essential for running a quality WordPress site. To make the most of your site and keep visitors and search engines happy, you need to gain a deep understanding of what affects WordPress speeds, how to identify a quality hosting provider, understand what makes a great hosting service, understand what your own unique needs and requirements are and know what the best plugs ins to install are. By using excerpts, splitting comments into pages, using a reliable CDN, updating your site with the best new plugins and themes, using faster slider and gallery plugins, optimising images, reducing database calls and HTTP requests, cleaning up your back end frequently, clearing out old post revisions, disabling hotlinking and leeching, preventing pingbacks and trackbacks and using GZIP compression, you can turn a poorly-performing or even merely adequate WordPress site into a great one. There are various techniques you can use if you have been searching for way to speed up WordPress.